My second and last Sniff My Tarts custom order arrived on Christmas Eve. And what a fragrant box of bliss it was to open. 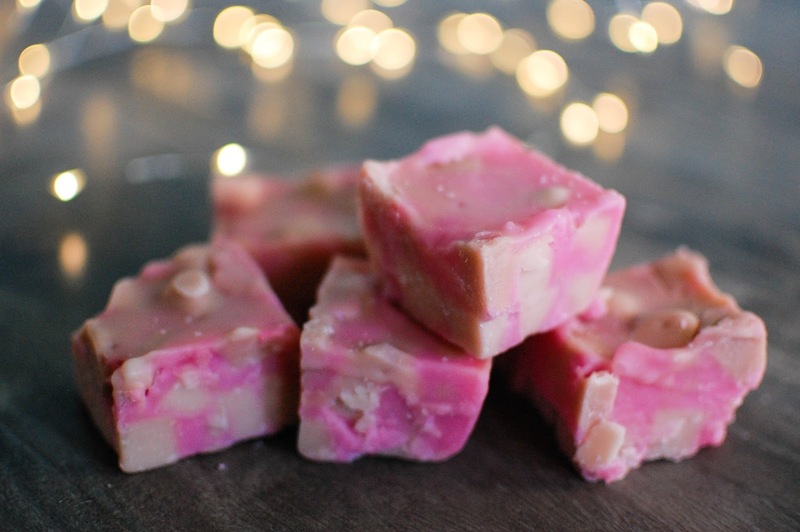 The Julie classic: a decorated sheet cake in Pink Peppermint. The perfect sleepy time scent. 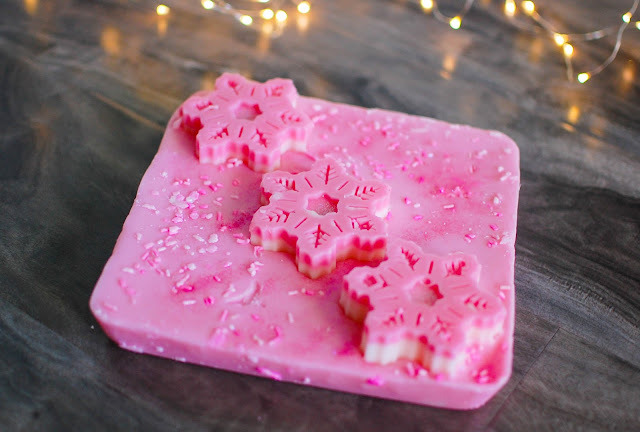 Powerfully minty and sweetened with the cotton candy musk of Pink Sugar. 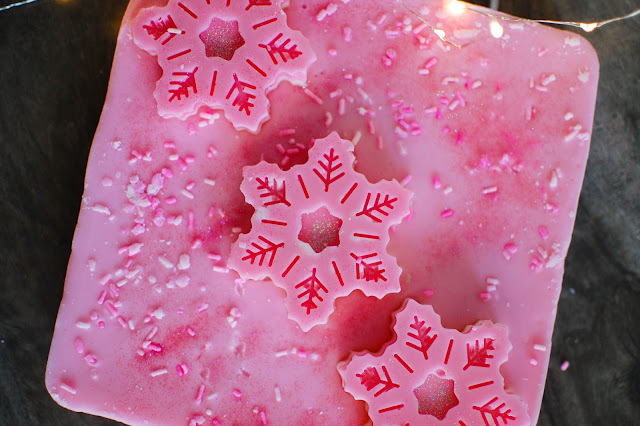 Layered snowflakes with glittery centers and cute sprinkles abound create one lovely hunk of wax. Even the bottom holds a secret snowflake surprise. If it didn't smell so ding dang amazing it might be hard to cut up. But it does smell amazing so I will happily do so. But not yet. I need to gaze at it a little longer. 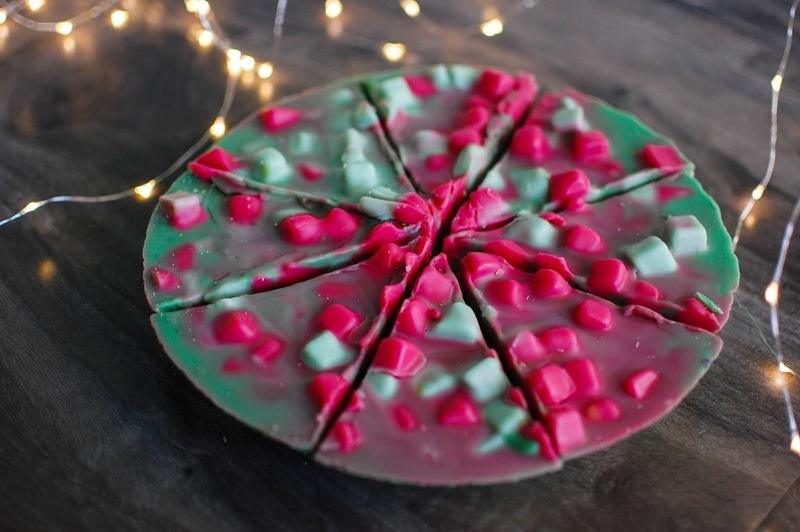 A large pie blended in Enchanted Forest/Frosty Pine/Dragon's Blood. Enchanted Forest and Dragon's Blood are two of my new favorites from Sniff My Tarts, and both of them having woody elements and a certain earthiness had me wanting to blend them. To highlight the mint in Enchanted Forest I added Frosty Pine too. The overall effect is one incredible pine scent with soft mint and a little cabin musk. A mountain scent to take me back to the Smokies. A handful of grubbies in Peppermint Coconut Filled Cake. 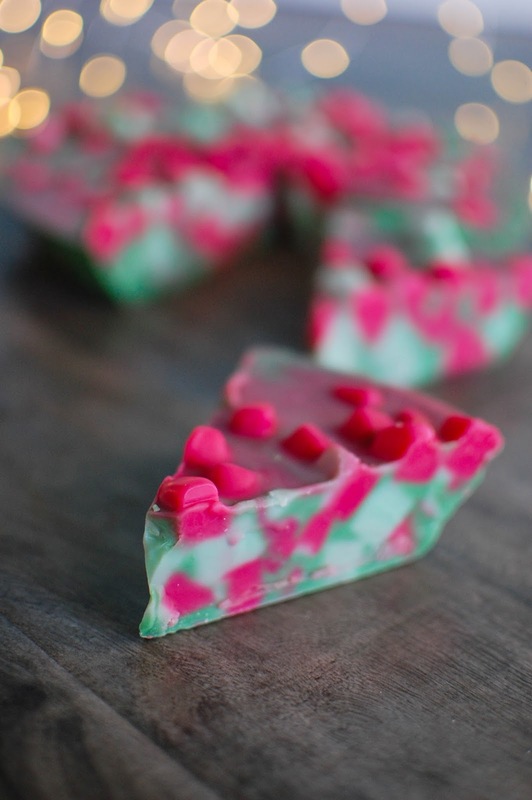 That same bright peppermint that Sniff My Tarts does so well, combined with creamy coconut cake. Yummy. I ordered four bags of chunks ($12.50 each) and this blend is Peppermint Swizzle Sticks/Spearmint/Enchanted Forest. It combines to make a unique twist on a traditional sweet spearmint scent. It almost has a woody anise tone. I quite like it! Sniff My Tarts releases new scents with every opening. I saw Amy and Donna added Ultimate Bakery and I knew I wanted to blend with it. Pink Noel/Ultimate Bakery/Vanilla Waffle Cone readily came to mind. And boy is it a hoot. Extra creamy vanilla bakery and fluffy pink sugar floss create a dreamy indulgence fit for a princess in an ice cream parlor. 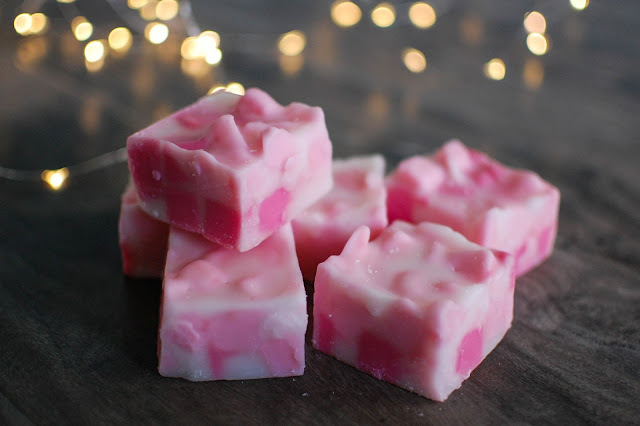 These chunks in Marshmallow Noel/Rose Jam/Serendipity hit my sweet tooth just right. Rose Jam and serendipity are two knock out scents, but blended together and mellowed with marshmallows they get along beautifully. Candied rose petals and creamy coconut, vibrant cherry and raspberry sauces all meld into rapture in a wax tart. If the blend above was rapture in a tart... this one is ecstasy in a tart. Vanilla Bean Noel/Marshmallow Noel/Blueberry Noel, the trifecta of Noels. 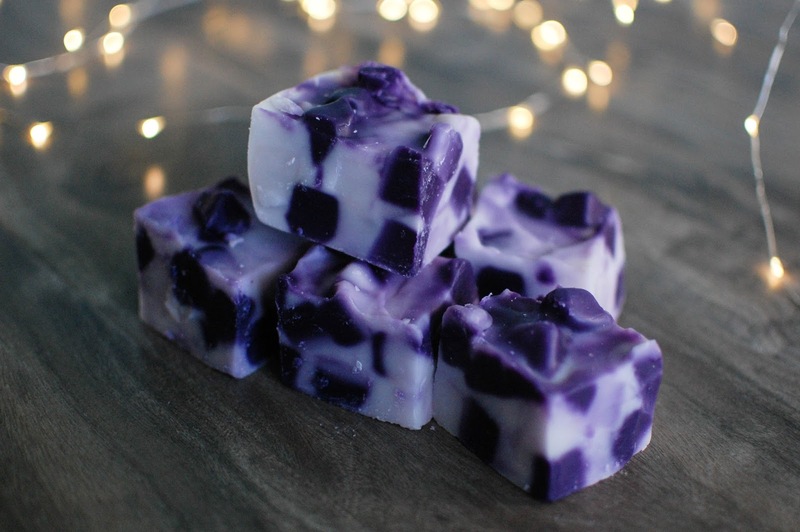 Sniff My Tart's Blueberry Noel smells deep, juicy and fruity. I feel my nose turning blue just sniffing it. Violet Beauregarde would approve. Even just as one of the chunks the Blueberry Noel really shines through. The Vanilla Bean Noel and Marshmallow Noel provide the perfect plush bed of vanilla cream for the blueberries to nestle upon. A brilliant blueberries and cream aroma. Whelp. That concludes this installment of Sniff My Tarts custom ordering. I hear they project a summer opening. In the meantime I will scour the RTS section and see if Amy and Donna do any flash sale customs like they did this year. Do any of these sound like a scent you would enjoy? *drools a bit* Boy do they ever! Pink Noel Ultimate bakery and waffle cone? Socks officially knocked off and all of the delicious peppermint! Yum! What a FANTASTIC order. LOL! It is such a wonderful bakery scent! I love how creamy and sweet it is. Thank you! It was fun ordering so fast but now a down side is that I don't have anything to look forward to arriving now. And I have to wait a good while before more I can order custom again. Though I may pop in for RTS every now and again. If I run low. Have you ordered from SMT? I have not ordered yet but I have a feeling I will have to soon with all of this goodness tempting me! I do love ogling over your SMT custom orders! Your combinations are always so different than what I would pick for myself and yet so intriguing. Always love your Dragon's Blood blends!! Kind of itching to do a custom order at some point - would you believe it's been since 2014 since I custom blended anything?! Since it's 2017, I guess you could say that it's been 3 years! How is the consistency of the packaging and scents? Back when I was ordering, it tended to be a bit of a hot mess - wrong scents used and packaging falling apart during shipments were two of my major issues. But damn if the wasn't still awesome! I loved the variety they had to blend with too. I wouldn't even know what to blend anymore! Thanks! The blending is indeed the exciting part. A little risk makes it interesting. The ladies have changed a lot in 3 years. 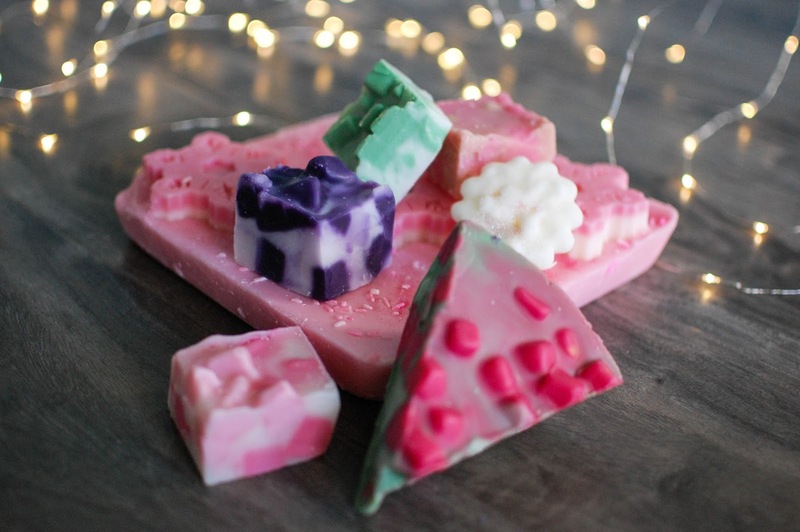 I think you would approve: less shapes so ordering is less overwhelming, new additions to the scent list each year, easier website, and best of all, better packaging! Every time I order, the piped hearts and sheet cakes comes wrapped in bubble wrap. The zip top bags are sturdy, there is plenty of tissue papers and additional bubble wrap if needed to tightly pack the box and have things arrive looking nice. Sometimes there are still breaks but I think that is more the USPS heavy handling rather than their packing. The piped hearts aren't smooshed and I love that. They used to be. 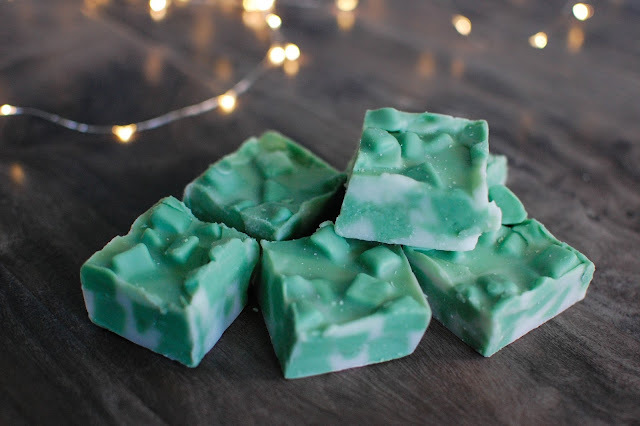 As fr as wrong scents... that may have happened only once with me and it was a peppermint blend i did that smelled like it had bakery in it about two years ago. But accidents do happen, especially with the volume they are working on. I am totally happy with my orders and enjoy the scent quality and throw. I would love to request some specific scents so I may do that one day. I would swoon if they could get Shannon's Twilight dupe. I bet you could come up with something. After all... you did the cotton candy butter brickle blend and that was amazing. You know which one I'm eyeing up that gorgeous green EF/FP/DB. I've had some yucky Dragon's Blood and some pleasant (House of Phoebe) if it's a smothering powder scent, it's no bueno. How would you describe this DB? Also, I'm wondering if I should check out rts, so I would know what to blend when there's an opportunity. Any RTS suggestions when you have a moment would be appreciated. It is one of my favorites! I have had some weird Dragon's Blood too. In fact, the first one they had was really floral and powdery. But they changed it out and I love the new one they use. It still is a little floral and soft (as most are) but not nearly to the extent it was. It has more of an earthiness to it that I love. So I would say it is a well balanced DB. Not overly earthy and not overly powdery/floral. Checking out RTS would be a great idea! Plus the blogger, Liz, at Furianne created some awesome SMT blends if you want to check that out and search her blog. And you can browse their current scent list on the website and get ideas just connecting a few scents here and there that you enjoy. As of right now they have a blueberry/cinnamon/waffle pie slice that looks amazing, you might like the Barbershop 1920's they have in stock or the sweet lavender marshmallow cake. Sinus relief is nice too. That all looks so fantastic - I'm now more excited than ever for my customs order. I got two decorated sheet cakes, both in fruity bakery scents, so I'm wondering what my decorations will be. The snowflakes are just adorable! 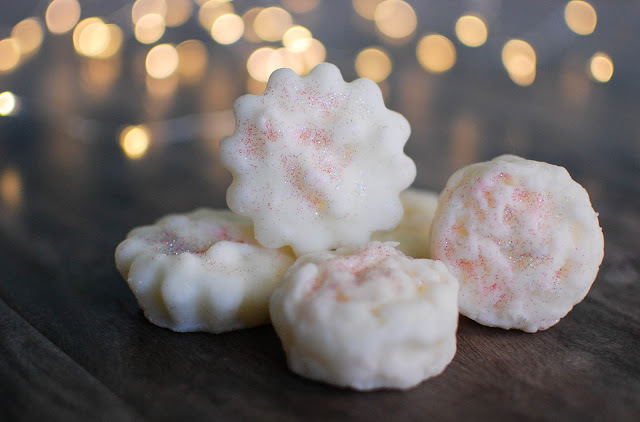 I wish I liked Pink Sugar scents more than I do (which is not very much; funny, as I used to wear it as a fragrance when it first hit the market) because you always make them sound fantastic, and I love the idea of pink peppermint. 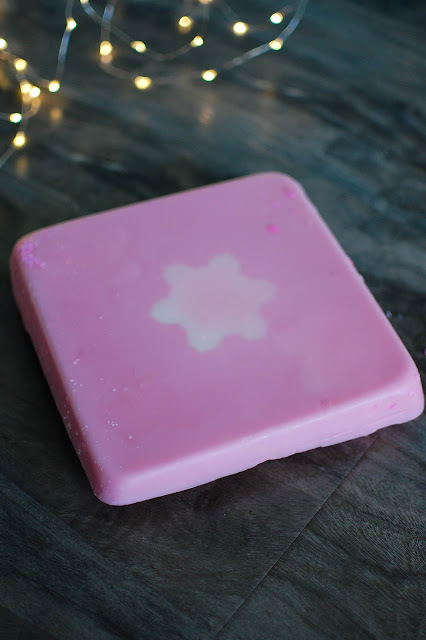 Pretty well the only Pink Sugar scent I could tolerate was a K's Kreations fragrance that blended it and a sort of cinnamony pumpkin. It was actually pretty great, so I guess I shouldn't talk too much smack about PS! And that Blueberry Noel guy looks devine! I saw that somebody on the SMT FB page bought some of your blends from the RTS section - I've seen this one and your Ultimate Bakery blend making the rounds. Your cakes will look AMAZING! The fruity bakery ones always come out looking way cuter than the types of blends I pick LOL! Pink Sugar in bakery is a weakness of mine. It is kinda funny that you wore it but don't really crave it in home fragrance because I relish it in home fragrance but I don't ever really desire to wear it in perfume. Talk all the PS smack you want dah-link... more for me! MUAHHAHAHAHAHA! The Blueberry Noel will make you want to do the Time Warp to my house and steal it. It is fabulous. The holy grail blueberries and cream. I hope the folks who ended up with them enjoy them. I know I will. Cannot wait to see your order! Thank you, I haven't checked Liz's site in awhile, I will do that. SMT's DB sounds really nice, thanks for describing it. I bet I would like the scents that you mentioned, I will have to carve a little time to peruse the site and get my creative blending juices flowing. Liz has some really creative blends! You are welcome. I hope I did it justice. You have plenty of time to think up blends... something like 5 months. LOL! But I like to write a few down here and there as I think of them or I will forget.